Avery Green has many instances of upside down pickets. When designing began, she was referred to as the downside-up, outside-in house – the desire was to twist the usual up-and-down and out-and-in boundaries in order to create an unusually porous relationship between architecture and landscape. 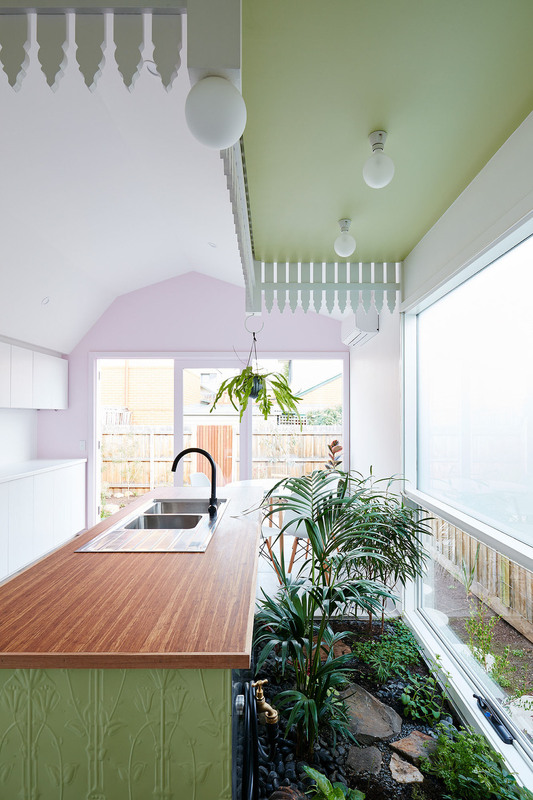 This was part of an interest in developing a contemporary version of the Victorian wintergarden – where the outdoors was bought inside – drawing a vibrant and vital aspect of the architectural lineage of the house out of the background and into the present. – to run along the exterior of the west wall (kitchen + bathroom) as a 'skirt', providing good ventilation to the subfloor of the structure while covering her steel 'legs' with an architectonic frill. 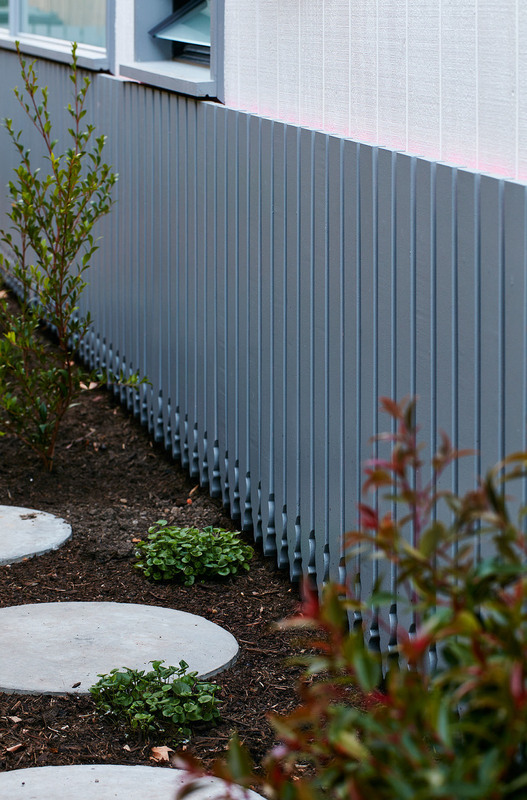 In this location they also stand as the fencing for the indoor garden that the bathroom and kitchen are. 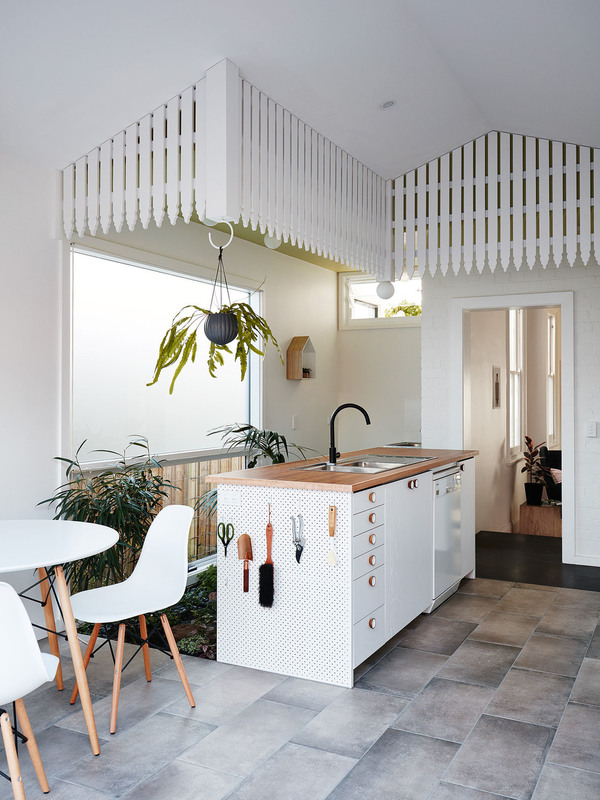 – inside in the kitchen, they draw attention to the ceiling as a kind of terrain, or upside-down valley, and emphasise the section that transitions between old and new. The hope was that such an emphasis would playfully suggest that this threshold operates as a slice of the outdoors. It quickly became evident, however, that the pickets offered even more than these spatial and referential roles. They do intricate things with light, casting shadows onto the ceiling planes and wall that offer texture to the space. The profile of the pickets themselves do their own light-plays, creating fine edge-glows at times, and forming slivers of light and shadow along their edges. Their 'windsor' profile join in with the curves and circles that are filtered through the details. Outside on the west wall, a bright pink paint is hidden behind them, such that a pink glow appears along the length of the west edge – like a waistband weaved and stitched with pink light. The back cantilevered step was then finished in the pickets as a final touch – an architectonic 'bustle' that hovers over ferns, rockery and the mudstone step. And, the pickets make people laugh or stagger, smile or shake their heads. The pickets are Avery's way of exclaiming – they are tantamount to an architectural gasp (uttered with light).